PHNOM PENH (Reuters) - Cambodia's parliament is reviewing a five-year ban on more than 100 members of the main opposition party, which could allow them to return to politics, following threats by the European Union to deny duty-free trading access to the Southeast Asian nation. The EU last month began a formal procedure to strip Cambodia of its "Everything but Arms (EBA)" initiative, after Prime Minister Hun Sen returned to power in a July general election in which his party won all the seats in parliament. 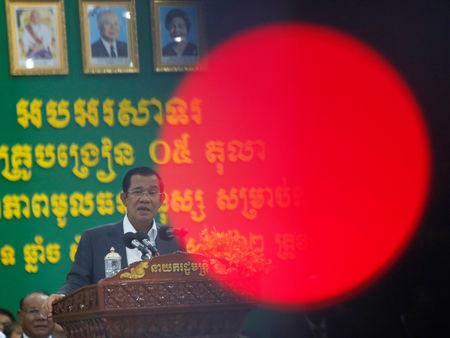 "In order to further promote democracy and the rule of law, the National Assembly is reviewing legal provisions to enable individuals who were banned from politics to resume their political activities," Cambodia's foreign ministry said on Monday. Cambodia's independent media also faced increasing pressure from Hun Sen and his allies ahead of the July vote. Washington-based Radio Free Asia (RFA) shut down its Phnom Penh office last September, complaining of a "relentless crackdown on independent voices". The government "always cherishes promotion of freedom of press and freedom of expression", the Foreign Ministry added in Monday's statement, saying the RFA and Voice of America were free to reopen their offices in Cambodia. The world's largest trading bloc has launched a six-month review of Cambodia's duty-free access, meaning its garments, sugar and other exports could face tariffs within 12 months, under EU rules. "These announcements are likely conditions under withdrawal of 'Everything But Arms (EBA)'," Naly Pilorge of the Cambodia-based Licadho rights group told Reuters. "As with any announcements made in Cambodia, it's only possible to assess if they are genuine after the implementation of such announcements," Pilorge said.